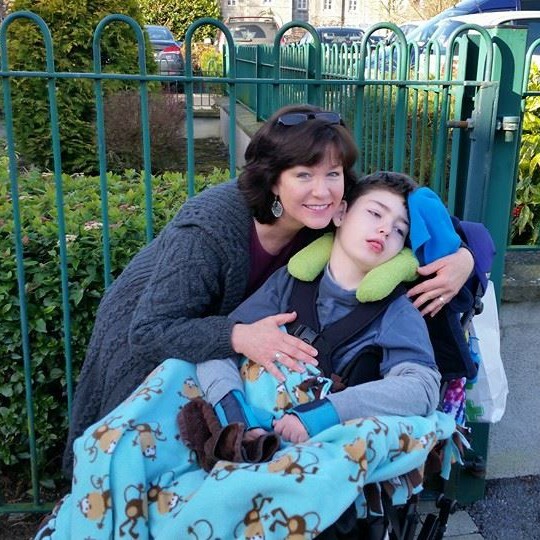 It’s a complicated thing, this journey with a child who has severe disabilities and a life-limiting illness. After 12 years, I’ve come to the solid conclusion that no matter how “outsiders” try to understand, they simply cannot. If you haven’t lived 24/7/365 in the house of someone on this journey, than you won’t understand. At least not fully. Friends, family, even new life partners that come in on the journey midstream, look in from the outside. They won’t fully understand because it doesn’t impact every minute of their lives like it does the one who is the full time, constant, carer. In fact, I think for the most part, it is still the mothers of these precious earth angels that truly, intimately, understand what this life entails. And, what it does to us as individuals, as a woman, as the person we used to be but now, often desperately, try to find glimpses of as we row our boat against the current. It is in this complicated, unspoken, and often tenuous understanding that we form a bond of solidarity which gives us strength and support that we quite frankly cannot find elsewhere…because again, no one else truly understands. With solidarity we can lift each other up, ready to carry on another day when we ourselves don’t think we can. As I lay in bed last night, it dawned on me that I didn’t go anywhere last week on my own, bar the 5 minute walk from my house to my youngest son’s school. Short of that, I always had one of my two sons with me. Now having said that, a level of guilt creeps in as I know far too many fellow mums who have lost their angel, as I will someday mine, and I know they would give anything to spend even another minute with their child. I even think that when it is my turn on this journey to be in their shoes, I will look back and feel badly toward myself for wishing I had those moments where I could just have a bit of peaceful solitude. I am sorry – now and in advance – for wishing this wish of even just an afternoon of nothingness, peace, quiet, beautiful solitude. Dare I even use the word freedom? In those much needed but all too rare moments of solitude, we can release, recenter, recharge, and simply BE. Yesterday, while out at the grocery store with my earth angel Brendan Bjorn, I made a quick stop at the bicycle shop. For 5 euros, I bought myself a bit of joy. I bought myself a fun reminder of when life was simpler. I bought myself that feeling of childhood freedom that comes with having nothing heavy on your heart and mind, only the feel of the wind on your face as you coast downhill on your bike. For 5 euros, I bought the most special-to-me purple and silver handlebar tassels…and with a giggle I put them on my bike and smiled, content in a way you wouldn’t understand unless you know what it is like to ache for that feeling of gently comforting solitude you get when, finally, you have a few minutes alone not having to hold your child’s fragile life constantly in your hands. Having a child with a life-limiting illness will either make you or it will break you. In fact, I think it does a bit of both. Ironic, but somehow, this journey works in the way of the yin-yang. Light and Dark. Positive and Negative. Strong and Weak. Walking on a cloud or down on your knees. Some days on this journey, you get that yin-yang effect in the matter of 60 seconds. I have two sons. My eldest, Brendan Bjorn, who is my child that is severely disabled, medically fragile, medically complex, and whose condition is life-limiting. My youngest, Declan, who started 3rd class at our local school just this morning. They are both the lights of my life. They are truly what keeps me going on so many levels I couldn’t even describe it adequately myself. They are my heart, quite simply. The joy this morning was walking my youngest son to school. His first day of 3rd class! The excitement! The pride! The love! His freckled face smiling and his green-gold eyes sparkling as we walked down the country lane chatting about what his first day would be like. Hopes, dreams, and the future. It was so beautiful. The fear this morning was as soon as I returned home. Brendan went into yet another grand mal seizure. The joy left and the fear jumped in it’s place. Yin and Yang. I learned long ago that you don’t have one without the other. From the smiling, freckle-faced son playing with his friends before the school door opened, to the beautiful, fragile, son convulsing out of control and not breathing. The automatic response system within me took over: Time the seizure; Monitor his O2 and heart rate; Make sure his airway is clear; Make sure his head is in a position that he won’t aspirate his own saliva; Check the clock again; Get the oxygen in hand; Get the rescue med also in hand as 3 minutes approaches…and wait and watch. That wait and watch that brings fear like you couldn’t understand unless you have actually seen your own child seizing. Once the seizure is over, there is the postictal phase. That is when the body is in a state of altered consciousness after the seizure. It usually lasts anywhere from 5 to 30 minutes. For my son Brendan Bjorn, his body trembles uncontrollably from head to toe, shivering as if he was left unclothed out on a cold winter’s day. His eyes closed, not fully present with me. I hold him, wrap him in his blanket and in my arms. “It’s ok baby, I’m right here, you’re ok now” I say to him as I stroke his soft, thick brown hair. I don’t know if he knows I am there. I do it anyway. It is during this postictal phase that I can let go of my emotions. We’ve made it through another one. He’s still with me, thankfully. And my head drops down on his weakened body…and the tears come streaming. I don’t try to control them. They need to be released. And with that over, my angel sleeps. He will be exhausted for the next couple of days, most likely. Me? I will be as well, but in a matter of a few hours my youngest son will be home, full of joy and telling me all about his first day back at school. Yes, the joy to look forward to is something I hold onto with all of my heart. It is the head that needs to hold onto it as well, though. That can be the tricky part, for the mind can wander into places it really should not go too often. There are times, like after a seizure, that parents on this journey with a child who has a life-limiting condition need to not think too much about the fear side of that yin-yang. Balance is key, albeit an often illusive key. We know all too well that you can’t have the yang without the yin, for they are two sides of the same coin, shall we say. They are the two halves which make up the whole. They are LIFE and all that it is made of for us on this special journey. We take the joy with the fear. We take the fear with the joy. And sometimes we have to take them both within 60 seconds of each other.